Many of you will have heard of a Brandy Alexander, but did you know that the original Alexander was actually made with gin? A much lighter drink (though it’s still predominantly cream! ), I find it a more balanced and surprisingly delicious cocktail. Created in the early 1910s in a restaurant in New York called Rector’s, the Alexander was served as the pre-dinner cocktail for a huge banquet. While looking for inspiration for a special cocktail for the event, the bar manager looked to the company hosting the dinner, Lackwanna Railroad, and was inspired by Phoebe Snow, a character used in its advertising. Dressed all in white to promote their smokeless coal, he created a drink to match. 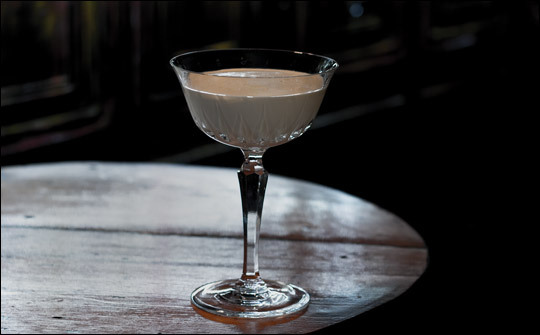 Its popularity is largely attributed to the fact that it used cream, which was not commonly used in cocktails at that time, and it wasn’t long before it had crossed the seas to Harry’s Bar in Paris, where Harry MacElhone included it in his drinks manual in 1922. Though it was Harry who made the substitution of gin for brandy, spelling the beginning of the end for this original, sadly. to sip, the pairing of nutmeg with cocktails that contain cream or milk is always a winner in my book. Add all ingredients into cocktail shaker. Add ice and shake. Double strain into a chilled Martini glass or coupe. Garnish with freshly grated nutmeg.